Leica DG Summilux 25mm f/1.4 ASPH. Lens is rated 4.8 out of 5 by 213. Rated 5 out of 5 by voezel from Just like the good old days... This prime is a must for any four thirds user. The sharpness is sublime, but the depth of filed takes me back to my OM-1 days with my F1.4 lens. Absolutely beautiful. Forget about zoom, just work a bit harder to get that right composition and be amazed. I have coupled this lens with my new OM-E1 and the combo is stellar. The lens does not feature any measure scale, which distracts a bit from its outer beauty. Otherwise fast focus, sharp and a must! One oddity though was that this lens became 20% more expensive two days after I bought it. Not sure if I would have bought it at current price compared to the OM prime at almost half. Rated 5 out of 5 by Bartlioni from Serious piece of pro quality glass My primary weapon is my E-M1 with grip loaded with either the 12-40 F2.8 or my new behemoth 40-150 F2.8. But I also carry an E-M5 loaded with a prime lens for targets of opportunity at weddings and indoor events. For all things indoor natural light, this lens is my goto glass. The zoomies just can't touch the performance of a quality fast prime in these situations. I avoid flash in these situations every way I can so I can capture the ambience of the environment. I'm an unrepentant gear junkie, and so the idea of 'if I only had one lens' is alien to me. If I only had ten lenses is more my style. But hypothetically, if I only had one lens then I must reluctantly confess this would be the one. Rated 5 out of 5 by Robert L. from Superb lens This lens is a joy to use! It is very sharp and offers a shallow depth of field. Image quality is amazing - especially wide open. I considered the Panasonic 20mm, f1.7 but decided the faster and longer 25mm, f1.4 would serve my needs better despite the extra cost. I use this lens mostly on my GH3 body. Both are fairly large for M43 and they go together nicely. This lens seems huge on my EPL-5 but photos are great. Focusing is adequately fast on either body. Given the fast speed and moderate focal length, I use this lens handheld most of the time and I do not miss in lens stabilization at all. I am very satisfied with this lens. Rated 5 out of 5 by Gary from Great wide lens I bought this lens to go with my Olympus OMD M1 MFT travel kit specifically as the lens for low light conditions. I also have the Leica Summilux lens on the Panasonic LX100 and have been very impressed. So far this new MFT lens has not disappointed. Build quality is very good. It is light weight and in conjunction with the M1 makes for a very lightweight duo. I have tested the lens in normal conditions and the IQ is great, so much so that I could almost travel with just this one lens. I like close ups as well and this lens does a great job there as well. AF with the M1 is lightning fast and spot on. Highly recommended. Rated 5 out of 5 by pmaholch from Great all purpose Normal Lens I keep this lens on my OM-D at all times. I like the rendering better than the Panasonic 20mm f1.7. It is sharper in the center than the panasonic wide open but the panasonic is sharper towards the edges. I purchased this lens knowing this and it suits my needs. I want the lens to be SHARP in the center wide open which is why I bought it and where it out performs the 20mm lens. I shoot wide open with this lens all the time ... its sharp where I want it to be. I like the rendering. Its a bit more dreamy than the 20mm. I like it better than the 20mm. Of course this is subjective. Your taste may vary! Rated 5 out of 5 by Chris is his own Grip from Great Bokeh I got exactly what I wanted out of this lens. I wanted a crisp interview subject in sharp focus in the foreground and an out-of-focus interior shot of the building in the background. This lens delivered with lots of light. I did also get plenty of DoF when I wanted it for shooting exteriors of the same building. Pretty good performance for a little lens that didn't break the bank.I shoot in mixed AF/Manual so the AF speed issue isn't as much a factor for me. I didn't hear the lens on the video I shot and I didn't have a problem quickly focusing on moving targets. Seems pretty sturdy to me. Rated 4 out of 5 by CS from great lens with a distracting feature I bought this lens for my Olympus PEN E-P3 to satisfy my requirement for a fast prime. It is well made and performs very, very well in all situations. However, on my E-P3 it chatters loudly in all but very dim light. After looking into this I concluded it is not a defective lens, it is just the way it works. . Aperature closes and opens continuously to adjust to changing light conditions. Why this is a problem for me: I already have a noisy DSLR and part of the appeal of the MFT system is its quiet operation. Still, it is a very nice lens and I would recommend it, but expect some noise. What lens hood does it accept? which adapter should I use for sony a7? This lens is designed for a different sensor format and won't work on a Sony A7. Answered by: Yo Han K.
How does this compare to the Panasonic Lumix G 25 mm F 1.7 ASPH? Both lenses would be good options. However, the Panasonic Leica Summilux DG 25mm f/1.4 lens is slightly brighter and sharper compared to the Panasonic LUMIX G 25mm F1.7 ASPH. lens. Both lenses have similar vignetting and chromatic aberration performance. Panasonic Lumix G 25mm f/1.7 ASPH lens is lighter in weight and focuses closer at its minimum focus distance, focusing at 9.84&Prime; (25 cm) compared to the 11.81&quot; (30 cm) minimum focus distance for the Panasonic Leica Summilux DG 25mm f/1.4 lens. This lens is compatible with the Olympus Pen F and can be used for portraits. Does this work with GH5's DFD? Yes, it is supported according to Panasonic's information on their Advanced Depth-From-Defocus AF System. How does the Panasonic Leica DG Summilux 25mm f/1.4 ASPH. Lens compare to the Lumix 25 mm F 1.7 ASPH? What's the optical difference between this lens and the previous version which features an aperture dial? Does this lens require an adapter for use on the Olympus OM-D? No. This lens will be fully compatible with the Olympus OM-D series camera bodies without the use of an adapter. 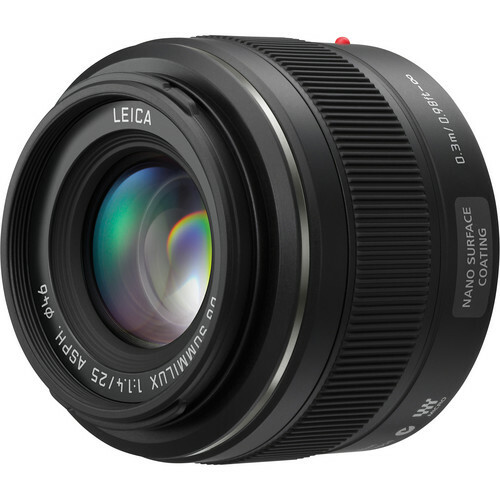 This Panasonic 25mm f/1.4 lens will be compatible with all micro four thirds camera bodies.